At Silent Signal, we use Amazon Web Services for various purposes (no, we don't run code that handles sensitive information or store such material without end-to-end encryption in the cloud), and when I read that multi factor authentication is available for console login, I wanted to try it. 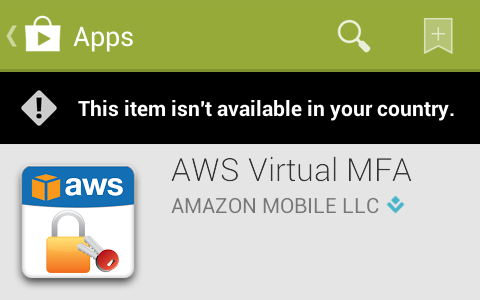 Amazon even had an app called AWS virtual MFA in the Play Store and in their appstore, but I couldn't find them on my Nexus S, so I tried a different approach by opening a direct link. The following message confirmed that I couldn't find it beacuse someone found it a good idea to geoban this application, so it wasn't available in Hungary. Although a month ago I found a way to use Burp with the Android emulator, but this time, I didn't want to do a man-in-the-middle attack, but rather just redirect all traffic through an Internet connection in a country outside the geoban. I chose the United States, and configured TOR to select an exit node operating there by appending the following two lines to torrc. TOR was listening on port 9050 as a SOCKS proxy, but Android needs an HTTP one, so I installed Privoxy using apt-get install privoxy, and just uncommented a line in the Debian default configuration file /etc/privoxy/config that enabled TOR as an upstream proxy. For some reason, the Android emulator didn't like setting Privoxy as the HTTP proxy – HTTP connections worked, but in case of HTTPS ones, the emulator just closed the connection with a FIN just after receiving the SSL Server Hello packet, as it can be seen below in the output of Wireshark. Even disconnecting TOR from Privoxy didn't help, so after 30 minutes of trials, I found another way to set a proxy in the Android emulator – or any device for that matter. The six steps are illustrated on the screenshots below, and the essence is that the emulator presents the network as an Access Point, and such APs can have a proxy associated with them. The QEMU NAT used by the Android emulator makes the host OS accessible on 10.0.2.2, so setting this up with the default Privoxy port 8118 worked for the first try. I installed Play Store by following a Stack Overflow answer, and as it can be seen below, it appeared in the search results and I was able to install it – although the process was pretty slow, and some images are missing from the screenshots below because the latency of TOR was so high that I didn't wait for them to be loaded. Having the app installed on the emulator, it's trivial to get the APK file that can be installed on any device now, even those without network connection. $ adb pull /data/app/com.amazonaws.mobile.apps.Authenticator-1.apk . I still find Burp Suite the best tool for web-related penetration testing, and assessing Android applications are no exception. In the past, I used my phone with iptables, but lately – especially since the emulator supports using the host OpenGL for graphics – I started to prefer the emulator. First of all, setting an emulator-wide proxy is really easy, as Fas wrote, all I needed was the -http-proxy command line argument. Because of this, I had to start the emulator from command line – I've only used the GUI provided by android before. I looked at the output of ps w for hints, and at first, I used a command line like the following. Since using the Android emulator without hardware rendering would've been like using Subversion after Git, I looked into the matter and found that I just had to set the LD_LIBRARY_PATH path to the tools/lib subdirectory of the SDK. Now I could intercept various TCP connections using Burp, but in case of SSL connections, certificate mismatch caused the usual problem. Luckily, Burp provides really easy ways of exporting the its root CA certificate in the last few releases, I chose to export it into a DER file by clicking on the Certificate button on the Options subtab of the Proxy tab, and selecting the appropriate radio button as seen below. 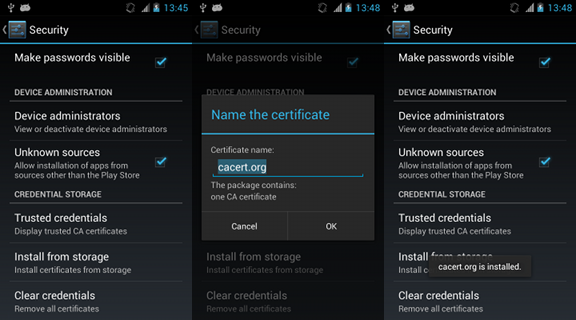 Android 4.x stores root CA certificates in system/etc/security/cacerts/ in PEM format, so running the following command gives a chance to review the certificate before adding and the output can be used directly by Android. As rustix wrote, the file name needs to be the the hash of the subject of the certificate, in case of the above certificate, it can be calculated as the following. Now all we need is to upload the file using adb. The error message was fairly straightforward, /system is mounted read-only, all we need to do is remounting it in read-write (rw) mode. That's a tougher one, but easily solveable by resizing the system partition using the emulator command line argument -partition-size. With this change as well as the library path for OpenGL, the full command line looks like the following (of course, 64 should be removed if you're using a 32-bit OS). Since restarting the emulator wiped my changes from /system, I had to upload the certificate again, and finally, it appeared in the list of system certificates. This being done, all applications using SSL/TLS connections (except for those that do certificate pinning) will accept the MITM of Burp, as it can be seen below with Google as an example. 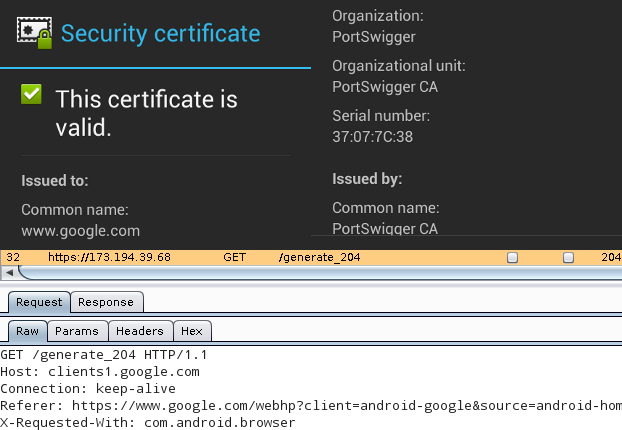 The top half is the certificate viewer of the Android web browser, stating that Portswigger issuing a certificate for www.google.com is perfectly valid, while the bottom half is the Burp Proxy window, showing the contents of the HTTPS request. On 11th March 2013, MWR Labs announced a challenge that involved an Android application called Evil Planner. I got the news on 12th March around 17:00 and by 20:30 I found two vulnerabilities in the application and had a working malware that could extract the data protected by the app. The app I created as a proof-of-concept is available in its GitHub repository, and below are the steps I've taken to assess the security of the application. The application itself was quite simple, and seemed secure at first sight. It required the user to use a PIN code to protect information entered. Unlike many application it even used this PIN code to encrypt the database, so even if the device was stolen, the user shouldn't have worried about it. Further static code analysis revealed that the PIN code was stored in the file using a simple method of encoding (I wouldn't dare calling it encryption). Although variable names are not available to JD-GUI, it's still easy to see what happens: the getDeviceId method returns the IMEI of the device, and this gets XOR'd with the PIN string. The result can have weird characters, so it's Base64 encoded before being written to creds.txt. As you can see, this method of encoding is easily reversible, but I wouldn't even need to go that far, since there's a decryptPIN method as well that performs the reverse of the code above. Thus acquiring the PIN code protecting the application is only a matter of accessing the creds.txt, which has its permissions set correctly, so it's only accessible to the Evil Planner. However, using apktool to get readable XMLs from the binary ones used in APK files revealed that the application exposes two content providers whose security implications I already mentioned with regard to Seesmic. Since the content provider is not protected in any way, this makes it possible to access any file with the privileges of the Evil Planner. In the proof-of-concept code, I used the following function to wrap its functionality into a simple method that gets a path as a parameter, and returns an InputStream that can be used to access the contents of that file. Having this, reading the contents of creds.txt only took a few lines (and even most of those just had to do with the crappy IO handling of Java). Since I had access to every file that Evil Planner had, the rest was just copy-pasting code from JD-GUI to decrypt the PIN, get the database file in the same way, decrypt that using the PIN, and dump it on the screen. All of the logic can be found in Main.java, and the result looks like the following screenshot. I'd like to thank the guys at MWR for creating this challenge, I don't remember any smartphone app security competitions before. Although I felt that the communication was far from being perfect (it's not a great feeling having the solution ready, but having no address to send it to), it was fun, and they even told me they'll send a T-shirt for taking part in the game. Congratulation to the winners, and let's hope this wasn't the last challenge of its kind! At the end of 2012, I realized that two of the software I started using in that year started with the letter 'm', and later, I remembered two other as well, so here's this post to document what I used in 2013. In the last ten years, I always preferred IRC to XMPP/MSN Messenger/Skype since although all of them has both the option to one-to-one and many-to-many chat, latter is the common use-case for IRC while former is with all the others. That's when Stefan showed me OTR (Off-the-Record) messaging, which provided strong autentication and encryption along with deniability afterwards. We started experimenting with version 1 on IRC using irssi-otr, but found it to be quite unstable, and another big problem was that I prefer to run irssi on a remote server, which defies the whole purpose of the end-to-end security OTR aims to provide. So I decided to give it a try with XMPP, especially since H.A.C.K. has its own server – with registration available to anyone – at xmpp.hsbp.org. Stefan recommended me mcabber as a client, and although it has its limitations (for example, it cannot connect to multiple servers and I had to use Pidgin for registration), I found it perfect for my use-cases, as it has built-in support for OTR up to version 2, and has a nice console UI. I didn't know what DLNA was before I got my hands on a device that actually supported it, then I started using Serviio, but it had its limitations. It required Java, updated the local repository really slow, had an awful and complicated GUI – and had I mentioned it ran on Java? After a week, I started looking for alternatives, I naïvely typed apt-cache search dlna and that's how I met found minidlna, which was quite the opposite of Serviio. I think SSH is one of those software that demonstrate the power of “the Unix way” the best. I use it for lots of purposes, but at the same time, I've found it really hard to use in case of laggy connections. I cannot even decide, which one I hate better, both cellular data connections (GPRS, EDGE, 3G, etc.) and suboptimal Wi-Fi networks can make me want to smash the keyboard. 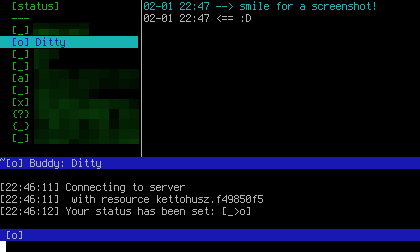 After using mosh while uploading huge videos over a consumer-grade asymmetric uplink, I also found that networks without QoS can also make the interactive SSH experience turn into a text-based RPG. I installed mosh on the two boxes I most regularly log into via SSH, and found it really useful, especially since Daniel Drown patched mosh support into ConnectBot, an Android terminal emulator and SSH client, which makes sense, since handheld devices have the most chance to be connected to networks matching the description above. Although some say it breaks interactive applications like VIM, I had no problems with version 1.2.3 I downloaded and compiled almost two months ago, so if you also find yourself connected to laggy networks, give it a try! I've been a KMail user since around 2007 and although I saw many of my friends using mutt with server-side magic, I used it just like my window manager and my shell – a tool, which I used until it worked without a hassle. When it misbehaved or crashed (it did so quite a few times), I sent bugreports, partly to make myself feel better, partly to evade “and have you reported it” questions, but I also hoped that they'll fix these properly. Then one day, during an IMAP mass move operation, KMail crashed, and did so even after restart. I've had quite an experience in bruteforcing KMail into a working state from the past, but when I couldn't change the situation in half an hour, I decided that it's time to change. I had three mailboxes on two IMAPS servers with two distinct SMTPSA MTAs to send mails through, and I also used client-side filtering extensively. I migrated latter functionality to procmail on one of the servers, and as of February 2013, I use a transitional setup with on-line IMAP mailboxes and a local header cache. In the near future, I plan to migrate online IMAP access to a solution based on offlineimap and run a local MTA that forwards mail to the appropriate SMTP server, preferably through a tunnel/VPN to avoid password authentication and my endpoint IP address appearing in the MIME envelope. I only had one problem so far, it seems that the online IMAP functionality is not so well-tested in mutt, so even though I use Debian testing, it crashed in around 30% of the cases when changing IMAP directories, but I managed to solve it by compiling Mutt from source, including the folder sidebar patch. Here's how it looks with the current config, displaying the Python SOAP mailing list. I like to synchronize photos taken with my Android phone with my notebook, and since I dislike centralized solutions (mostly for reasons of privacy), I installed rsync for Android, which is easy to install from Play Store, and with SSH public key authentication, syncing the images is easy and secure at the same time. My problem was that still hadn't collected enough information to trust my phone with powerful public keys (even though I use APG, I only added public keys so far), and having a key on my phone that could allow anyone to log into my notebook through SSH was unacceptable for me, even though I set up a separate user account, and SSH wasn't set up to start at boot. To solve this problem, I logged what command the application started upon connecting via SSH, and added the following line to the authorized_keys file in the .ssh subdirectory of the home directory of the dedicated user (foo). The lines are split only for easier readability, there should be no line break or whitespace between no-port-forwarding, and no-agent-forwarding. forward TCP ports, SSH agent or X11 connections from/to my notebook. Thanks to rhapsodhy for the inspiration. In the August 2012 hekkcamp I hunted for security vulnerabilities in several Android applications and Seesmic Android happened to be one of them. I originally heard about it from rhapsodhy, and it's one of those multi-platform social network clients, this one having the advantage of not requesting crazy privileges, unlike the official Twitter and Facebook apps. Zsombor told me about Mercury, a FLOSS Android vulnerability assessment tool, so I checked out the latest development version from their GitHub repo since 1.0.0, the only version available then happened to be incompatible with recent Android releases. Using Mercury, I found that Seesmic offers several content providers that not only had interesting names and fields, but were available for reading to any other application running on the device. As Android separates applications pretty strictly, these providers are the favorable way of sharing structured information between apps, and although they can be protected with application-specific permissions, many developers tend to forget about such things. In case of Seesmic, I used the finduri command of Mercury in the provider module. In order to inspect the extracted data and provide a nice and simple proof-of-concept, I developed a small application called CoProLeak (CoPro = Content Provider) that could show the two of the most problematic leaks in the Seesmic application. It's worth noting that the application doesn't require any permissions – as it can be seen on the left frame of the screenshot below – so it could lurk inside any kind of application or game. The content://com.seesmic.facebook/facebook_people provider made all the Facebook friends of the user available with name, Facebook ID and full contact information. This can be seen in the middle frame of the screenshot below, clicking on a person's name displayed his/her photo using the Facebook graph API in a browser window. The content://com.seesmic.twitter/accounts provider made all the accounts configured in the application available with username and password or OAuth token and secret. This can be seen in the right frame of the screenshot below, these credentials are enough for anyone to impersonate the user account. As it turned out, contacting a social media related company with such delicate matter wasn't trivial. For purposes of feedback, they had a public forum, which was obviously not the place to describe vulnerabilities in detail. On their about site, I found the e-mail address ContactUs at Seesmic dot com, and sent them a mail right after the proof-of-concept worked. I waited for a month, then tried contacting them on their Facebook page, where they replied 5 days later, and said to open a ticket in their Zendesk system. After I did so, they replied that they'll “let [their] Dev Team know about this as [they]'ll review the issue”. I waited for another two months, and then one day, I just opened the notification on my Android phone that a new version of Seesmic was available, that contains “security improvements”. 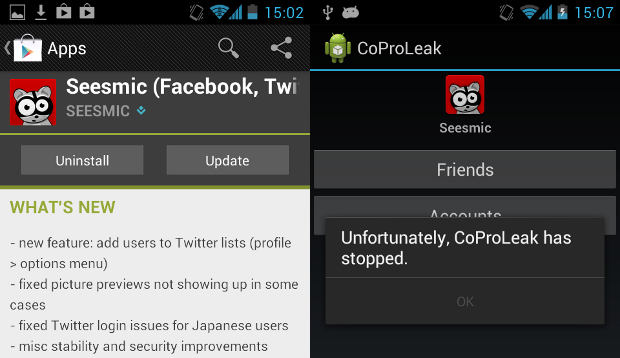 Since they haven't released an update through the Play Store since summer, I immediately tried CoProLeak and I was pleased to found that both functions of the proof-of-concept application crashed with permission problems. To be sure, I checked the logs with ADB, and it's pretty clear that the application gets terminated because of (unhandled) permission denial. On October 6, 2012, Matthias Müller sent me an e-mail, telling me that the download functionality of ADSdroid was broken. As it turned out, AllDataSheet changed their website a little bit, resulting in the following exception getting thrown during download. That didn't seem that bad, so I wrote a simple regular expression to handle the issue. The regular expression is overly liberal on purpose, in the hope that it can handle small changes in the AllDataSheet website in the future without upgrading the application. I pushed version 1.2 to GitHub, and it contains many other optimizations, too, including enabling ProGuard. The resulting APK is 30% smaller than previous versions, and it can be downloaded by using the link in the beginning of this sentence, or using the QR code below. It's also available from the F-Droid Android FOSS repository, which also ensures automatic upgrades. 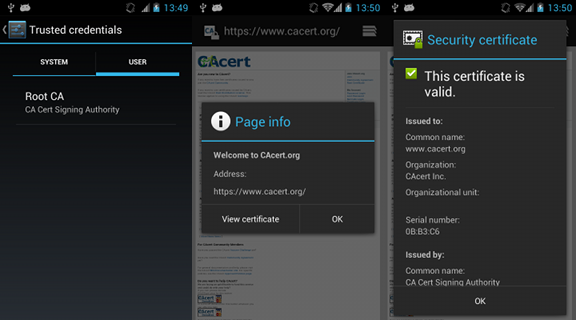 I've been using CAcert for securing some of my services with TLS/SSL, and when I got my Android phone I chose K-9 mail over the stock e-mail client because as the certificate installation page on the official CAcert site stated, it required root access to access the system certificate store. 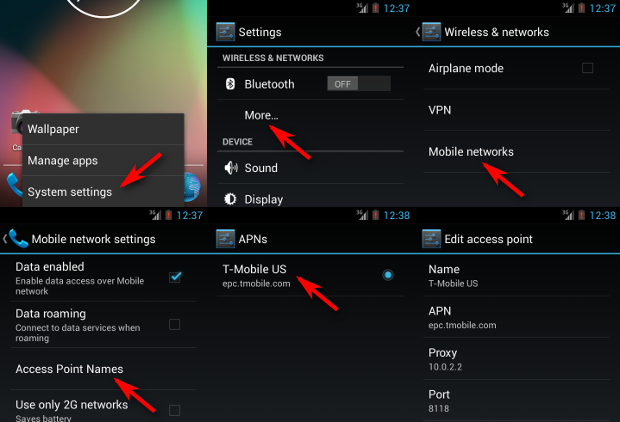 Now, one year and two upgrades (ICS, JB) later, I revisited the issue. As of this writing, the CAcert site contains another method that also requires root access, but as Jethro Carr wrote in his blog, since at least ICS, it's possible to install certificates without any witchcraft, using not only PKCS12 but also PEM files. Since Debian ships the CAcert bundle, I used that file, but it's also possible to download the files from the official CAcert root certificate download page. Since I have Android SDK installed, I used adb (Android Debug Bridge) to copy the certificate to the SD card, but any other method (browser, FTP, e-mail, etc.) works too. On the phone, I opened Settings > Security, scrolled to the bottom, and selected Install from storage. It prompted for a name of the certificate, and installed the certificate in a second without any further questions asked. After this, the certificate can be viewed and by opening Trusted credentials and selecting the User tab, and browsing an HTTPS site with a CAcert-signed certificate becomes just as painless and secure as with any other built-in CA. In February 2012, I read the Hack a Day article about ElectroDroid, and the following remark triggered challenge accepted in my mind. the datasheet for any imaginable component. All this app does is open a web browser to their website. Nothing more. A bookmark can suffice. The Android application built around this API displays a so-called Spinner (similar to combo lists on PCs) to select search mode and a text input to enter the part name, and a button to initiate search. Results are displayed in a list view displaying the name and the description of each part. Touching a part downloads the PDF to the SD card and opens it with the default PDF reader (or prompts for selection if more than one are installed). 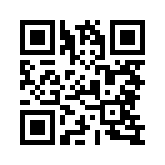 You can download version 1.0 by clicking on the version number link or using the QR code below. It only does one thing (search by part name), and even that functionality is experimental, so I'm glad if anyone tries it and in case of problems, contacts me in e-mail. The source code is available on GitHub, licensed under MIT. When I got my Android phone, I tried to make it work with my e-mail server which supports TLS and SSL using a CAcert certificate. 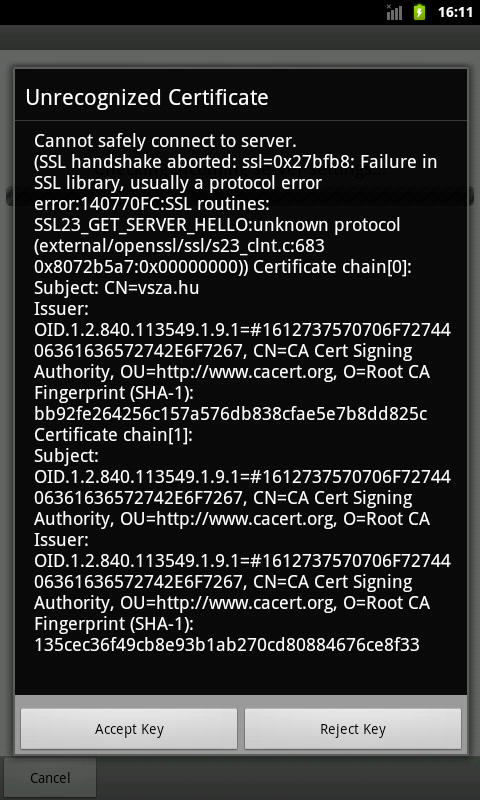 CAcert is not yet present in the Android list of root certificates, and an FAQ entry of the official CAcert site along with two Android issues (6207 and 11231) state, that since this list is writeable to root only, it requires rooting of the phone, which I've considered an overkill. I also found that the stock Mail application had only two options for TLS or SSL security: either accept all certificates, thus creating a false sense of security, or accept certificates only from the read-only list. I tried an alternative mail client called K-9 mail, which had more options available, as it allowed the user to examine the certificate, and accept it to be used in future communications. 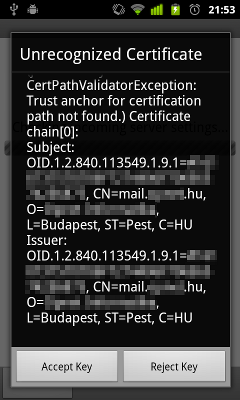 I configured the mailbox, and got a nice dialog box asking me to confirm the details of the certificate. Unfortunately, the only problem with this dialog box was making the whole feature useless: it didn't contain the checksum (also known as fingerprint) of the certificate, which is the only value not spoofable by a man in the middle (MITM) attacker. There are point-and-click tools available on the web that can create a rogue certificate matching the original one in every detail, and the only difference is the public key, which affects the checksum. I developed a patch to fix this problem, which was accepted after a short discussion, and later made its way into the Android Market. First, I found, that the checksum algorithm is SHA-1 most of the time, since MD5 is considered broken for this purpose. To calculate the SHA-1 hashes of the certificates in the chain, I imported the necessary classes and instantiated the SHA-1 MessageDigest class. I spent most of the time figuring out how to extract the content of the certificate that needs to be hashed. As Roman D figured out in a post on Stack Overflow, “the hash is calculated over the DER-encoded (again, not the PEM string) TBS part only, including its ASN.1 header (the ID 0x30 == ASN1_SEQUENCE | ASN1_CONSTRUCTED and the length field)”. Knowing this, I just needed to extract this information form the instances of the X509Certificate interface. I tried the getTBSCertificate method with no luck, but later found that there's a method inherited from Certificate called getEncoded, which does just what I needed. There was only one task to do: since the MessageDigest object returns the digest in raw bytes, I needed to convert them to hex digits in order to display it in the dialog box. It turned out, that the project already had a class for that, so I could avoid reinventing the wheel. After development and building, there was only one task: testing. I installed the modified version into an emulator and tried to configure an account on my mail server. It worked, and as you can see on the screenshot below, the checksum matches the one you can CAcert fingerprint page.